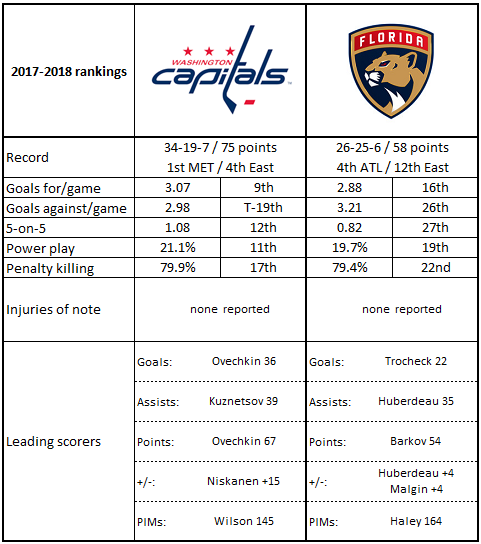 The Washington Capitals head back on the road and hope to find some spark there as they visit south Florida and the Florida Panthers on Thursday night. The Caps actually have a better record on the road in their last five out-of-town games (3-1-1) than they do at home over their last five contests at Capital One Arena (2-2-1). The Panthers are making a late run, but it might be a bit too late to challenge for a playoff spot. Florida is 7-3-0 over their last ten games, and they might be slipping back into mediocrity with losses in each of their last two contests going into this game. It is no mystery regarding the recent overall success. The Panthers scored at least three goals in each of the seven wins and did not reach three goals in any of the three losses. Evgenii Dadonov and Aleksander Barkov have combined to record almost a third of the 34 goals the Panthers scored over their last ten games, five apiece. This is Dadonov’s second tour with the franchise. He was taken by the Panthers in the third round (71st overall) of the 1007 entry draft. After three seasons with only intermittent play with the big club, but after two more seasons in Russia and a year and a half in the AHL, with some intermittent action with the Panthers, he was traded to the Carolina Hurricanes with A.J. Jenks for Jon Matsumoto and Mattias Lindstrom in January 2012. At the end of the 2011-2012 season he headed back to Russia, signing with Donetsk in the KHL. It was not until last July that he returned to the team that drafted him, signing as a free agent with the Panthers. In his second tour with the club he is having a career year. His 49 games almost matches his total in his first tour (55 games over three seasons), and his 15 goals is more than his total in his first tour with the club (ten). He comes into this game with points in four of his last five games and 8-8-16 in his last 18 games. Dadonov is 2-1-3, minus-4, in eight career games against Washington. Barkov is not just scoring on his own, he is involved with Panther scoring generally over their last ten games. With a 5-6-11 scoring line, he has been involved in almost a third of the Panthers’ goal scored by himself. The five goals scored has allowed him to hit the 20-goal mark for the third consecutive season, and his 54 points overall put him close to his career best of 59 points in 66 games of the 2015-2016 season. The odd part of his goal scoring to date is the drop in efficiency from his previous two seasons. In 2015-2016 Barkov had 28 goals on 171 shots (16.4 percent shooting), and last season he had 21 goals on 142 shots (14.8 percent). Going into this game, he has 20 goals on a career high 185 shots (10.8 percent). Five of those goals are shorthanded, most in the league. Barkov is 3-4-7, plus-3, in 11 career games against the Caps. That Keith Yandle would lead the team’s defensemen in scoring over the 7-3-0 run (2-8-10) is not a surprise. The Mike Matheson would be second – and the leader in goals – might be (4-4-8). Matheson was a first round pick of the Panthers (23rd overall in 2012) and appeared in 81 of 82 games last season, his rookie year (second in the NHL). He has already surpassed last year’s goals, assists, and points (7-1-0-17) in just 56 games this season (8-14-22). The Panthers depend on his production for success, going 14-5-0 in the 19 games in which he registered a point this season and going 5-2-0 in those games in which he scored a goal. And, his being on the ice is generally a good luck charm, the Panthers with a 12-4-1 record in games in which he skated more than 22 minutes. In five career games against the Capitals, Matheson is 1-0-1, even. 1. In their 7-3-0 run, Florida has out-shot opponents by a 352-313 margin (plus-3.9 shots per game). 2. Over that same ten-game span, the Panthers have the best power play in the league at 12-for-34 (35.3 percent), those 12 power play goals also being most in the league over that span (tied with Tampa Bay). 3. Florida is tied for the league lead this season in shorthanded goals scored (nine, with Buffalo…go figure). 4. No team in the league has more penalty minutes per game than Florida (11:41), largely a product of their leading the league in fighting majors, and by a wide margin. They have 34 fighting majors to 23 for the Anaheim Ducks. 5. Florida might be doing better if their possession numbers were better when they were ahead. In the rankings at NHL.com, the Panthers rank 14th in shot attempts-for percentage when behind (53.69), 18th when tied (49.47), and 17th in close situations (50.29). But when ahead, they rank only 27th (44.14). 1. When the Caps recorded 37 shots on goal against the Tampa Bay Lightning on Tuesday night, it broke an eight game streak in which they did not record more than 30 shots on goal in a game (they had 30 in the 3-2 win over Buffalo on Sunday). 2. The Caps allowed just 19 shots to the Lightning on Tuesday, a season low in shots on goal allowed. The previous low was 23, accomplished three times. 3. Jay Beagle’s individual shot attempts-for percentage on ice (38.84) is second worst in the league among 617 skaters appearing in at least 25 games (Buffalo’s Jacob Josefson has a 37.91 percent in 29 games). 4. Alex Ovechkin is tied with four other players for the league lead in overtime goals with three (David Perron, Sean Monahan, Nathan MacKinnon, and Brayden Point). 5. Ovechkin leads in shots on goal, but Dmitry Orlov has been on ice for the most shot attempts by the club at 5-on-5 (1075, 37 more than John Carlson). Ovechkin ranks third with 907. It has been a hard year on goalie Roberto Luongo. He missed 33 games over two tours on the injury list, missing six games to a broken thumb in October, and then missing 27 games after suffering a groin injury on December 4th. He could end this season appearing in fewer games over a full season than any in his 18-year career in the NHL (he appeared in 24 games in his rookie season with the New York Islanders in 1999-2000. Luongo, the oldest goalie in the league to dress this season (he will be 39 years old in April), is the only goaltender active in the league to have dressed for an NHL game before the calendar rolled over to the year 2000. This will be Luongo’s first home game (assuming he starts) since his return. He split two road decisions, stopping 30 of 33 shots in a 6-3 win over the Calgary Flames on February 17, and stopping all but one of 31 shots in a 1-0 loss to the Toronto Maple Leafs on Tuesday. In his limited duty this season he has faced a lot of rubber. In nine of his 17 appearances he faced 35 or more shots on goal, although he does have a .934 save percentage in those games to go with a 4-3-1 record (one no-decision). Luongo is 20-12-3, 2.39, .924, with two shutouts in 38 career appearances against the Caps. Those 38 appearances are tied for second-most among active goaltenders, with Marc-Andre Fleury. Cam Ward has 41 career appearances against the Caps. It has been a rough season for Andre Burakovsky, too. Limited to 34 games due to injury (23 games to illness and a broken thumb) and inconsistent play, he has just 14 points this season (six goals, eight assists) and is a minus-9, second worst on the team (Brooks Orpik: minus-11). He was showing signs of coming out of his season-long funk with six points over an eight-game stretch from January 25th through February 15th. However, he is without a point in his last three games and is a minus-4 over that stretch. Not only has Burakovsky’s production overall been disappointing, it has been inconsistent. He has points in just ten of those 34 games, although if you are looking for a silver lining, he has three multi-point games, all of them in wins and all of them on the road. And, he has to do more with the ice time he gets. Burakovsky has logged 13 or more minutes 20 times this season. In those 20 games he is 4-5-9, minus-3, and the Caps are 6-10-4 in those games. Not the profile one might want in a top-six forward, the expectation for Burakovsky. He is 2-2-4, minus-5, in nine games against Florida in his career. The Caps have alternated wins and losses on the road since sweeping the Carolina Hurricanes ten days apart in early January (4-2-2). Continuing the pattern would mean a loss in this game, the Caps having taken advantage of the Sabres in Buffalo last Sunday. Patterns aside, this is a game the Caps could, should, and must win, if they are to continue to be a credible contender for the top spot in the Metropolitan Division. Yes, they currently occupy that spot and would occupy it even with a loss (Pittsburgh, one point back, does not play again until Friday). But the Caps are entering what should be a soft spot in their schedule – Florida, Buffalo, Columbus, and Ottawa, only Columbus playoff eligible and occupying the second wild card spot at that. If the Caps don’t make hay here, the sun might not shine so brightly after it with a game against the spunky Toronto Maple Leafs and then the three-game California trip following. It makes beating the Panthers a priority.